Ever feel like some game developers are just butchering your favorite video game franchise from your youth? Or maybe you’ve always wondered what testing a game feels like. In The Magic Circle: Gold Edition, you get to experience a taste of the game development process. Originally released last year on Steam via Early Access, developer Question has had the game ported over to the PS4. Dripping with sarcasm and intentionally poor level design, is this satirical game going to resonate with fans, or will it just annoy? The games industry feels like it’s in a constant, immature stage of development. With the dawn of the internet generation, gamers have grabbed a lot of power from developers. Thanks to websites like Kickstarter, players are now self-entitled “hacktivists,” who tell game designers what stories they want to be told, even if that story has been in development through multiple iterations, taking up several years of the designer’s life. Developers aren’t so innocent in this era, either – egos can get the best of, well, everyone, and if one is held up on a high enough pedestal, they can very quickly forget where they came from. When they fall (and they will fall), it will be a gory, public, execution, be that execution metaphorical or otherwise. This is the world of The Magic Circle, at least, as told without spoilers. The overarching story is that you play as a game tester in a game that has been in development hell for about 20 years or so. Parts of the game even appear to be at least that old. This is a relatively short trip – most people will be done with the game within 4 hours or so. It’s an entertaining, slightly preachy, occasionally even dark, story about what’s wrong with mainstream video game development. Question is a small development studio, but perhaps this is based on some experiences their members have had when working as a part of a larger studio (some of the team have BioShock and Dishonored work to their names). Either way, the events that unfold out in the “real” world seem based in reality, and it will definitely cause many of us to pause, if only for a moment, and reflect on the state of the industry. Most of the The Magic Circle’s puzzles are not particularly hard, and you may feel that you’re wasting time on such trivial tasks at first. Most of them boil down to finding the right power to strip from an enemy, and then either turning that enemy into an ally, or putting their power on a different ally. Though solutions are easy, there are still several unique ways to go about finding them. 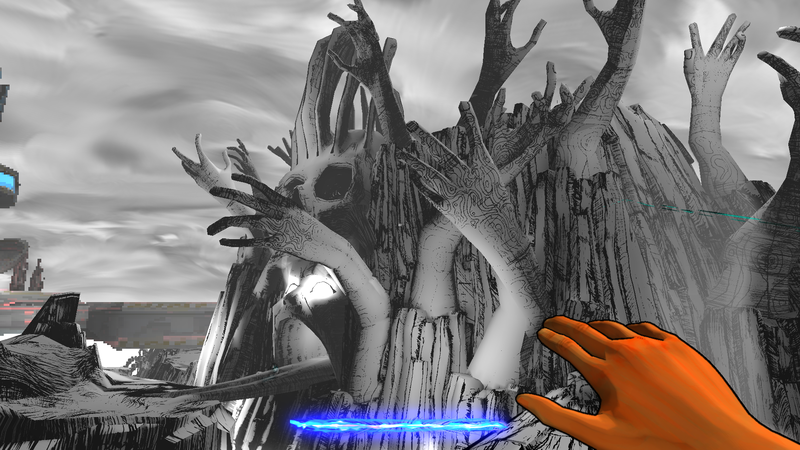 The Magic Circle is at its core a puzzle game. You are able to trap enemies by using a magic circle (hence the title), which will freeze them in place. Pressing Square will allow you to edit certain properties of the character, such as who they attack, who/what are their allies, what special abilities they have, etc. You can also strip them of any or all of these abilities, in order to put them on other characters. Your own character does no direct fighting. Simply messing with the variables and abilities on hand is enough to get you through the entire game. This game has surprising graphical fidelity considering it’s a Unity game. There are the occasional frame rate issues when recalling any allies to your side once there’s a bunch of them at your disposal, but the issue remains temporary. There’s artwork from all different genres of games on display here, both in HD resolution, and old, ’90s-retro blocky resolution. There’s a purposely minimalistic aesthetic going on, because the game you’re testing is still in-progress. This game-about-a-game really just has a story to tell, and to the end it succeeds with a voice cast that is enjoyable to hear. There’s the grating, narcissistic, creepy old game designer; a young, hip, but ultimately jaded, pro gamer; a naïve, worshipping, innocent-sounding intern; and the entity trying to free himself from the game, who gives you the power of control over some of the game’s aspects. Each character is very well voiced. Beyond that, the soundtrack is mostly forgettable, however a nice touch is that sound effects match the era of video games in which you find yourself. Playing in an older area of the game? Expect to hear beeps and boops in low resolution, and instantly be hit with a blast of nostalgia! The Magic Circle will appeal to anyone who can laugh at themselves. The story told here forces you to get a little introspective, especially if you’ve ever backed a game and then felt betrayed by the developer when their finished product is nothing like what you expected. This is also a game for anyone who thought they could’ve made a better Duke Nukem Forever (hint: that was a train wreck from the first delay). But with such a short, occasionally preachy story, this doesn’t appeal to everyone. The Magic Circle: Gold Edition review code provided by publisher. For more information on scoring please see our Review Policy here.